Find top 3 banks or brokers for stock and fund investment. Check the pros and cons of the banking services for fund investment and stock trading. It is essential to find the right bank or broker for your investing account. It is difficult to find the right bank or brokers to use for your investing account. There are lot of selections from new online broker and well established bank. Investors can also choose a cheap online broker for their investment account such as retirement account or regular brokerage account. The most respected and well established banks or brokers are continuing to offer the best deal. Bank of America is one of the top online banks in U.S. 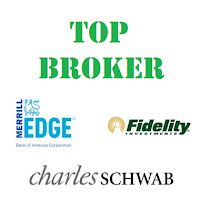 The Bank of America Merrill Edge online brokerage offers free trades for up to 30 trades per month if you have a minimum of $25,000 in your Bank of America accounts. While this requirement is a lot for some customers, they do provide good customer support. If you don’t have $25k account balance, you can still use the online trading platform for $6.95 per trade. Merrill Lynch / Merrill Edge offer extensive investment research for investors. You can also invest in various investments funds through Merrill Edge Select Funds for mutual funds or Merrill Edge Select ETFs for ETFs (Exchange Traded Funds). For stock trading, it provides stock screener, technical analysis and various education materials. Bank of America (BofA) also offers lots of financial services. It provides mortgage, checking account, saving account, insurance, credit cards, and more. 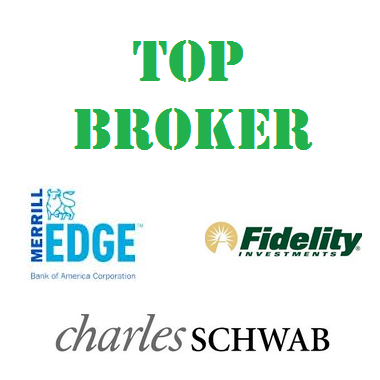 Fidelity is one of the most well-known online brokerage among investors or traders. Fidelity Investments have a very powerful brand behind their name. They have started to revamp their fees structure to attract new customers. It also provides various new financial services or cash management such as credit card, bank account, ATM card or debit card, BillPay, and more. Nowadays, Fidelity offers trades for $7.95 per online trade with unlimited shares and unlimited trades. This fee is lower than Schwab, TD Ameritrade, and E*Trade. You can also invest in various investment funds for free such as mutual funds or iShares ETFs. Fidelity also offers live chat through online, though it is not a 24/7 service. You can get a free phone support for faster service as well. This online brokerage is a great choice for beginner investors or retiree with individual retirement account (IRA) or starter brokerage account. Fidelity also provides various 401(k) accounts for big corporates or businesses. Charles Schwab or Chuck is becoming popular among investors. Schwab has introduced various low cost index mutual funds or ETFs (exchange traded funds) for long term investment. As a brokerage company, you can trade stocks or ETF funds for $8.95 per trade. It is great for a place to find the whole investment package. Schwab also offers traditional banking features, online stock trading, and various retirement accounts or plans. It also provides no load mutual funds for investors. Currently there are about 300 local offices around the US. You can visit the office for consultation, deposits, customer care, etc. You can also reach the customer support through phone, or email.